Something more always happens whenever Sara shares the message about Unity Gardens . It was a very engaged group . I can always tell by the questions , and reactions in the crowd ...they get it . But More ... In the Hall shortly after the presentation started I heard a man in the hall say " I don't need to go in I know about community gardens we have some in Bloomington " . Well I felt obliged to intervene , and say , " but you don't know about Unity Gardens" . He went in and watched the 2nd 1/2 of the presentation , and afterwards asked me for a flyer with our information . 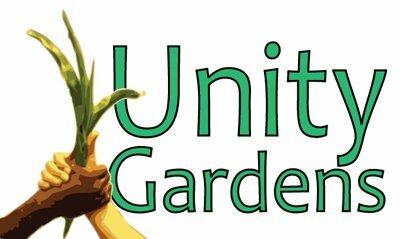 Unity Gardens are unique in the way they start with sharing not just with the members of a community , but with everyone . We share our food , we share our knowledge , but more of all we share a little bit of ourselves . Diverse people coming together is what builds a community . One of the few things we all share is the need for is healthy food . Without it we would not exist . I loved hearing Lisa whose patio overlooks a garden tell me she loves watching people stop , and harvest from the Garden . Then there was the gal who wanted to know more about how she could help connect with people in need. Grandmothers wanting to connect their grandchildren with gardening . the stories go on !! What a great group of people . THANKS for letting Sara spread the word about Unity Gardens ...Statewide soon !! !